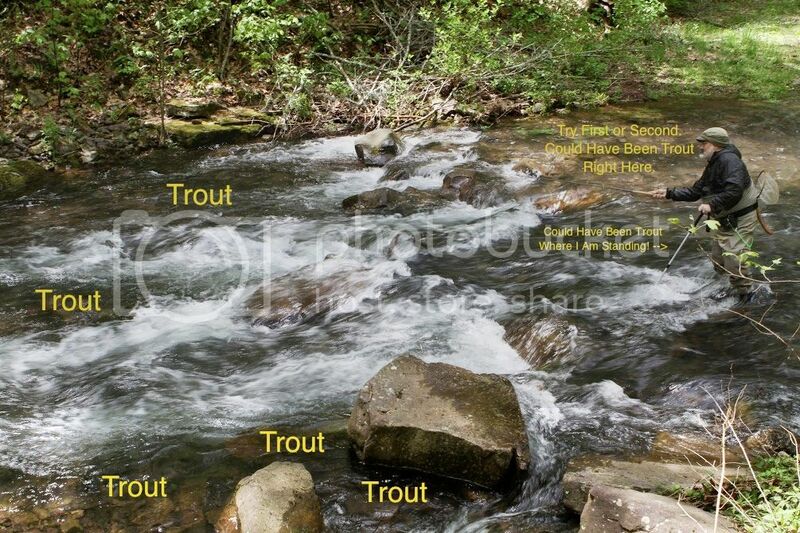 The most effective way to catch trout in the water in the pic is to stay out of the water. Easy to do using a tenkara rod…and using your head too. TJ, try staying on either bank and fishing upstream. Much easier …..when you learn the trick. TJ, I have always been amazed at how close to shore fish hang out, and if you sneak up on them especially using Tenkara ,you will have a fish on! Thank you for an interesting post. Great stuff TJ … keep at it! Stephen, with how clumsy I am, believe me, I stay out of the H2O as much as possible. hehehe. I enter when I need to get to the other side or casting will not reach if I stay on the bank. In this case of the attached picture, this is an actual trail that goes to the other side right thru the river and we had to cross to continue up to the Dam while in VA couple weeks ago. We had to cross this river several times as we worked upstream. I guess it was a jeep trail that went right through the river. Was fun. Michaela, yes amazed how close some fish are. Seem right at foot sometimes. It is amazing how close to shore fish with hold. I typically searcg for the ideal spot while walking up to the water, then fish my way to that spot starting at the shore. More often than not I catch fish on the way, and find the spot I thought was best was indeed empty.